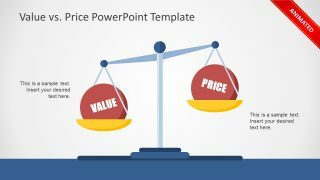 The Supply Preference Model PowerPoint Template is incredible presentation of procurement concepts. 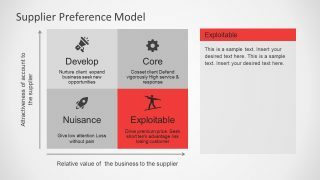 This is the supply chain management concept PowerPoint containing the visually interactive matrix diagram. 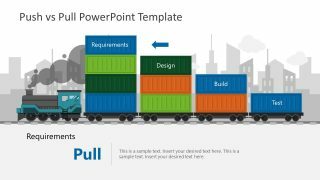 The use of colorful PowerPoint shapes and cool infographic clip art template makes the presentation more engaging towards the audience. The supply preference model itself is the analysis base upon two set of measurements. These measurements are, attractiveness of account and value of business to the supplier. The attractiveness of account explains the productivity while selling and purchasing patterns of buyers. 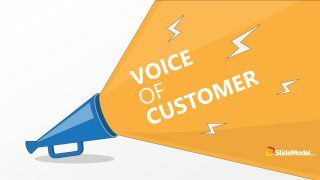 Whereas, the factors such as reliability and quality affect the value of account of business. 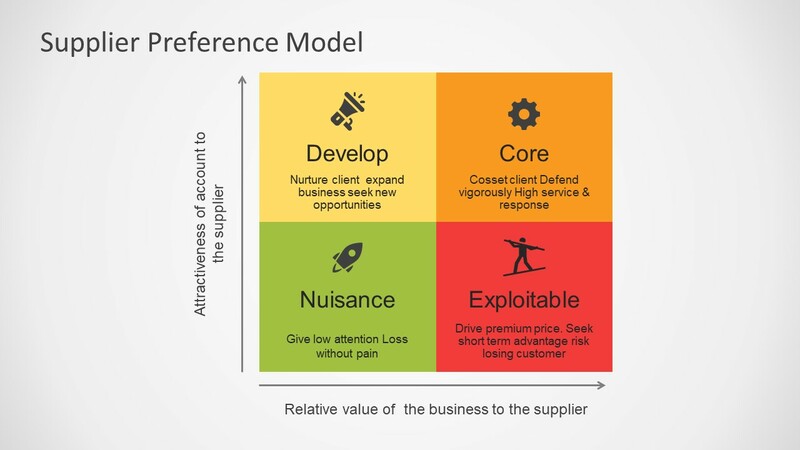 The supply preference model is a strategic procurement tool. It is also called supplier’s preference model, meaning, assessing how suppliers view the company. 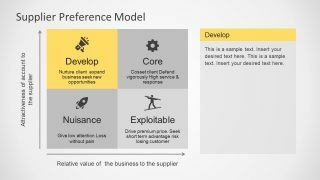 The Supply Preference Model PowerPoint Template provides the 5-slide presentation to demonstrate attractiveness of company towards suppliers. Further, the SlideModel models catalog has an attractive template of Supply Positioning PowerPoint. This is another supply chain management concept to assess the supplier’s performance before or during the procurement. 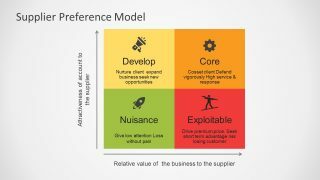 Moreover, the 2×2 matrix diagram has four components which assists the business professionals to rate suppliers based on attractiveness and revenue. 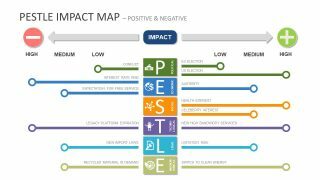 The outstanding matrix template of supply preference model is a four segment PowerPoint of amazing infographics. These infographic icons present the factors of matrix with most suitable graphical content. These include, megaphone, gear, rocket and ice skating in colorful section of the matrix. The subsequent four slides aids in appealing presentation design by highlighting each unit individually. The placeholders available in each slide layout assists in explaining the useful information via textual content.